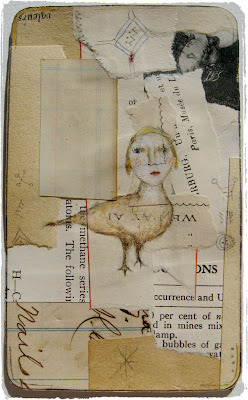 you are making art quicker then I can think..i'm still composing from tuesday but I had to say...yeah, it's a lynn bird. I love her, she's a nice person and wants to say something but she's shy...wings, she wants wings...i'll be back in a bit lynn...xxxx ani. really like this perbirdson. Wistful little bird lady. I love her and her patchwork background. i love this. i like the direction things are going in over here lately. Hi Lynne well its all been said and i totally agree with everyone , little bird lady is the best love her and i also love my prismacolors ..
Lynne, this is superb! I love it!!!! This is my favourite in this series! I'm partial to a bird lady! I agree about the feel of a pencil making a mark and so addictive once you start! I adore this little bird person...such a gentle little soul. i do appreciate the simple jOY of yOu! oh how I miss the simple joy of pencils... sigh.